Can you please tell me how to use it?? After downloading the extra modules using the updater (“Help > Check for Updates”, then click the “Download Now” button), they will be downloaded to a folder called “modules” in the same directory as HDoujin, and you can run them from there. 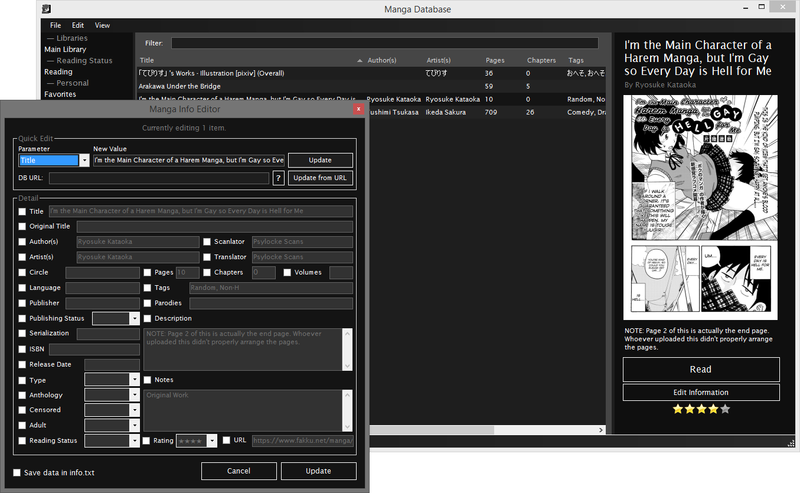 When you start up Manga Database for the first time, a dialog box will appear where you can specify your manga directory. After setting it, click “Continue”, and the program will scan your manga folder and will add what it finds to its database. You can watch the scan progress in the bottom-left corner of the window. That’s the basic idea for getting started with it, but if you have any specific questions, let me know! How can i open it, i update but have no idea where the software is? From the updater (Help > Check for Updates), click the “Download Now” button near the bottom. The updater will download the modules, after which they’ll be in a folder titled “modules” in the same directory as HDoujin. Wow so many updates. Great Work! Wanted to ask, I have been using the Doujinishi Renamer from this site https://doujinrenamer.wordpress.com/downloads/ which tapes into the https://www.doujinshi.org/ API to scan and rename folders/zip with the option of adding the metadata form the site into a xml format. I was wondering if it would be at all possible for the Manga Database to read the data like it was taken from the url? Just a wishful thought really. If I understand correctly, you’re basically asking for auto-tagging in Manga Database? In the “Edit Metadata” dialog, there’s a box where you can input a URL from doujinshi.org and have it fetch the metadata for the current item (however, someone recently told me this wasn’t working anymore; I haven’t released a fix yet*). Obviously, this is slow and doesn’t work for batch jobs. * I’m working on integrating auto-tagging directly into HDoujin for various databases (doujinshi.org included), so when that’s finished, I’ll make it work through Manga Database as well. Yea that’s about right more or less. I have actually used that dialog before when I was getting meta-data for some of my favorite authors but I hadn’t used it in awhile, didn’t know it was broken. Ahhhh, okay! Sorry for misunderstanding. That can definitely be done; I’ll try to add it to the next release of Manga Database. you can check that, please? Thanks for letting me know! It’s a false-positive; anti-virus programs just tend to complain since the source code is obfuscated. It would help me out if you could submit it as a false-positive (I assume this is from Avira). Then you’ll probably have to mark it as an exception for the time being– Otherwise, wait for them to clear it; I’ll be submitting it as a false-positive as well. Hey just to let you know that metadata doesn’t seem to be getting picked up properly if you are using the info file V2 or the .json. Yes, Manga Database will only read metadata for V1 information files. It has yet to be updated to support the new formats, but I’ll try to do that soon. This of course means they have to be tagged correctly to work well with the filters. 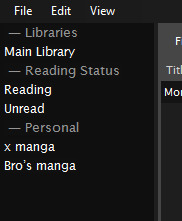 Keep in mind, however, the Main Library will be the one opened by default when the program is started, so all manga will be visible until a Collection is selected. just noticed that the manga database doesn’t import files with quotation marks in their names. Thanks for bringing that to my attention! I’ll have it fixed in the next Manga Database update. Update (03/03/2016): It’s been fixed in version 1.0.3.3; if you don’t have the modules set to update alongside HDoujin, you can use the “Download Now” button from the updater to update it manually. Awesome, this is exactly what i need now, i have literally more than 3 TB of comics and doujins to organizate (Somebody gave me the torrent of all doujinshis in pururin after it stopped working). Also a lot of other comics for my webs. As for the site not working, please send me some URLs to content you’re having problems downloading and I’ll fix it right away (as well as content from other sites, as I need to update it on a site-by-site basis). Sites like the one you provided tend to use a bunch of different image hosts, so I probably missed one. Update (01/23/2016): I scoured the site for a bit and did indeed come across some problem content– it should be fixed in the latest release. Quick question, what formats does the Database function with? Cant seem to add .cbz files, .zip works fine tho. It supports zip, .cbz, .rar, .cbr, .pdf and .7z. I tested it with some cbz archives just now and it loaded them successfully. A suggestion that immediately comes to mind is make sure there’s nothing wrong with the archives, which might cause it to have trouble accessing them (if that happens, they’re skipped over).